When approving Enrollment Requests in Manual processing mode, you have the opportunity to send families a saved e-mail and optionally include a financial statement and registration contract. The Enrollment Confirmation E-mail should be created and saved by launching the e-mail tool in Admin > Campers > Saved e-mails: Campers, or through the Action Menu on a Camper profile page. After creating the e-mail text, click Save e-mail. 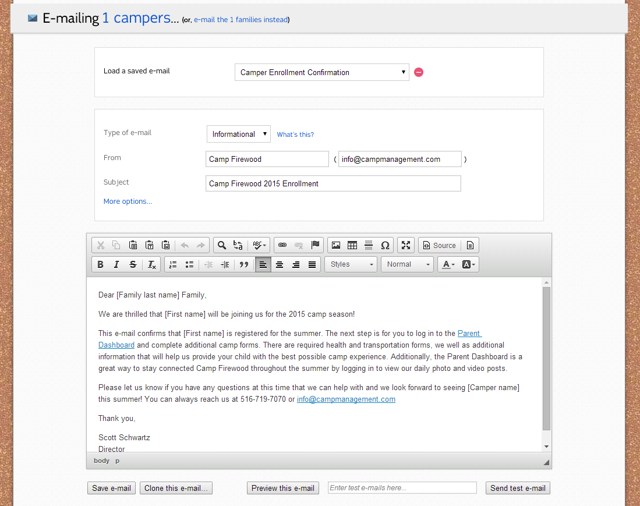 The saved e-mail will be available on the Saved E-mail dropdown list when approving camper enrollment requests. For more information on creating e-mails in CampSite, please refer to this video tutorial.